Submitted by Daniel Fehn on 01/07/2012 - 14:09. Although the muscle car era was short-lived, it still defined a generation in America, and has given us possibly some of the most collectible cars in all of automotive history today. With the sharp lines, wide profiles, muscular looks, and chrome, these cars looked mean. Team the mid-sized bodied frame with a monster V8 engine, and these cars WERE mean. Mean fast! 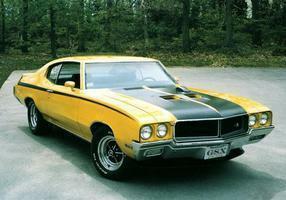 Some models that fit into the muscle car category are the Buick GS, Pontiac GTO, and the Dodge Charger. The Mustang debuted in 1965, and within it’s 2 first years sold nearly 1.5 million models. In specific technical terms, the Mustang is considered a pony car. A pony car is a small bodied vehicle, with large sized engines. It’s hard to argue that a Boss 409 couldn’t compete with a muscle car, so they are generally lumped together in the same category. Each year, muscle cars kept on getting bigger and heavier, due to added options. This lead to a new breed of stripped-down muscle cars, such as the Plymouth Road Runner and Dodge Super Bee. These were designed to have a lower cost than the other models, without the extra options and plush interior. They were designed to be cheap and fast, and you could go race on the same day you bought the car without any modifications – and probably win! As soon as the muscle car craze got to full speed, it slipped a gear and never recovered. The three main speed bumps were insurance premiums, tougher environmental laws, and the 1973 OPEC oil embargo. Safety lobbying groups started to raise concerns about stuffing such large engines in such small cars, and marketing them towards the younger generation. Ralph Nader and his lobbying group was already pointing out the inadequate handling, braking, and other safety issues with the base models. The tires performance on these models was also suspect. Adding a few hundred more horse power to these models was not going to make things better. Insurance companies eyes were opened up to these issues, and started adding large surcharges to high-powered cars. This quickly pushed many muscle car models out of a young buyer’s price range - the same group that were buying most of these cars. Congress started taking a harder stance on emission controls, and the automakers had to shift their priorities from creating more horsepower to cleaner emissions. Leaded gasoline was banned in 1973, and the auto manufacturers needed a few years to build up to this, so the engines were starting to be tuned down by 1971. The horsepower dropped with the use of unleaded gasoline, since the compression ratios had to be lowered on the engines. The higher the compression ratio, the more additives are needed to lower the chances of premature ignition. Up to this point, lead was the main additive used, but it is not good for the environment, obviously. Another thing that happened in 1971, although it didn’t physically change the output of the cars horsepower, was that the manufacturers were required to post the actual power ratings of their models, not just the engine ratings. Prior to this, horsepower was generally overrated. Overall horsepower was rated by the engine output, not the output at the wheels. Once you include the weight of the car, the transmission and gears, belts, etc. the raw power of an engine will drop drastically. Again, this didn’t change the actual horsepower, but the numbers started looking lower overall for the muscle cars, and technically any car after 1971. The final nail in the coffin to the muscle car era was the 1973 OPEC oil embargo. Oil imports into the US and other parts of the world from OPEC oil producers fell around 25% - 30% in late 1973 to mid 1974. Gasoline became so scarce during this time, that long lines formed at gas stations, where gas could be found. Many fuel stations were empty. To lessen the chaos, license plates ending in odd numbers were only allowed to purchase gas on odd numbered days, and vice versa for even numbered license plates and even numbered days. Detroit could not sell a new car that had such low miles per gallon, and the muscle car era was over. The last true high powered muscle car could be the 1973-1974 Pontiac Trans AM SD455.